(भारतीय वन सेवा सिलेबस 2019, डाउनलोड यूपीएससी आईएफएस परीक्षा पैटर्न) The Candidates who are going to apply for the Indian Forest Service of UPSC can look at UPSC IFS Syllabus 2019 on our page. According to the Vacancy notification, the huge number of candidates applied for the UPSC IFS Recruitment 2019. Therefore, candidates need to do a lot of work to qualify the Indian Forest Service Exam. Here, we are providing the syllabus, exam pattern, exam interaction of UPSC IFS Recruitment. The examination process will be conducted in 6 steps of different subjects. Therefore, candidates must check the exam syllabus before starting the exam preparation. Latest Update: UPSC is going to conduct the Indian Forest Service 2019 Prelims exam on 02nd June 2019 and Mains exam on 01st December 2019. Candidates can check the UPSC IFS Prelims & Mains Syllabus 2019 from here. The Examination will be held in six parts. Paper 1 is of General English, paper II is of General Knowledge and Paper III, IV, V & VI is of any two subjects to be selected from the list of optional subjects and Each subject will have two papers (Paper-I & Paper-II). Cropping pattern in different agro-climatic zones of the country. Important features, scope, and propagation of various types of forestry plantations such as extension, social forestry, agro-forestry, and natural forests. Cultural, biological and chemical control of weeds. Soil physical, chemical and biological properties. Soil conservation planning on a watershed basis. Water-use efficiency in relation to crop production, criteria for scheduling irrigations. Farm management, scope, Importance and characteristics, farm planning. ENGINEERING MECHANICS STRENGTH OF MATERIALS AND STRUCTURAL ANALYSIS. 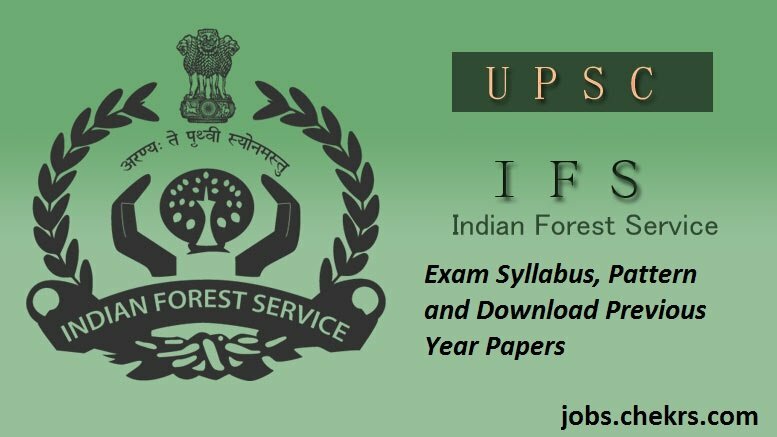 Candidates who applied for the Indian Forest Service jobs are searching for previous year question papers can visit our page. Hence we are providing the Indian Forest Service Practice Papers along with the Study Material and Preparation tips. The candidate will start preparation according to the previous paper pattern and get more score in the UPSC Recruitment 2019 Exam. For more information, we can update soon about UPSC IFS Recruitment 2019 and we are providing the latest update related to upcoming Recruitment on our website that is www.jobs.chekrs.com. If you have any query about UPSC Exam Pattern, Syllabus that you can write comments on the commenting box and take a review or feedback.